The President of CBS News is David Rhodes. He was hired in February 2011. He was formerly the Vice President of News at Fox “News”. Again, the current President of CBS News was formerly the VP of News at Fox “News”. Again, the guy who cut his teeth in the news business, beginning as a Production Assistant and working his way up to become VP at Fox “News”, is now the President of CBS News. The complete segment, with correspondent Lesley Stahl, is posted at the bottom of this article, so feel free to judge for yourself. 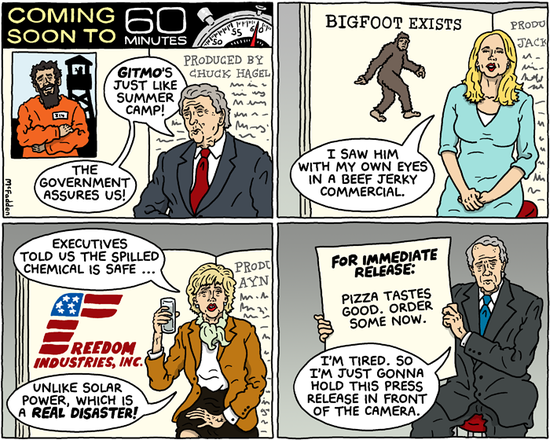 But coming on the heels of 60 Minutes’Benghazi hoax debacle last November, a soft-ball, one-sided puff piece on the NSA in December, and a number of other similar missteps, Sunday’s piece on the failures — and largely, only the failures — of the so-called “cleantech revolution” suggests that while it hasn’t yet become Fox “News” proper, the once-venerable news magazine no longer seems to be serving the public interest, but rather…some other interest. The general premise of this week’s segment was that investment — both public and private — in the cleantech sector since Obama has taken office has been nothing but a disaster. While there have certainly been failures in the sector, it was not noted during the segment, as several critics of Sunday’s piece have pointed out since, that the U.S. Dept. of Energy’s loan program to green startups has a 97% success rate. 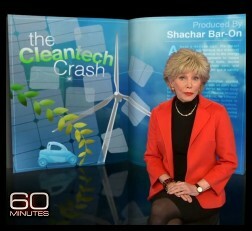 This entry was posted in media, politics, scandals and tagged "cleantech revolution", 60 Minutes, Brad Friedman, CBS News, David Rhodes, Fox News, Lesley Stahl, The Brad Blog, The Cleantech Crash. Bookmark the permalink.